What cheese should I use for quiche? 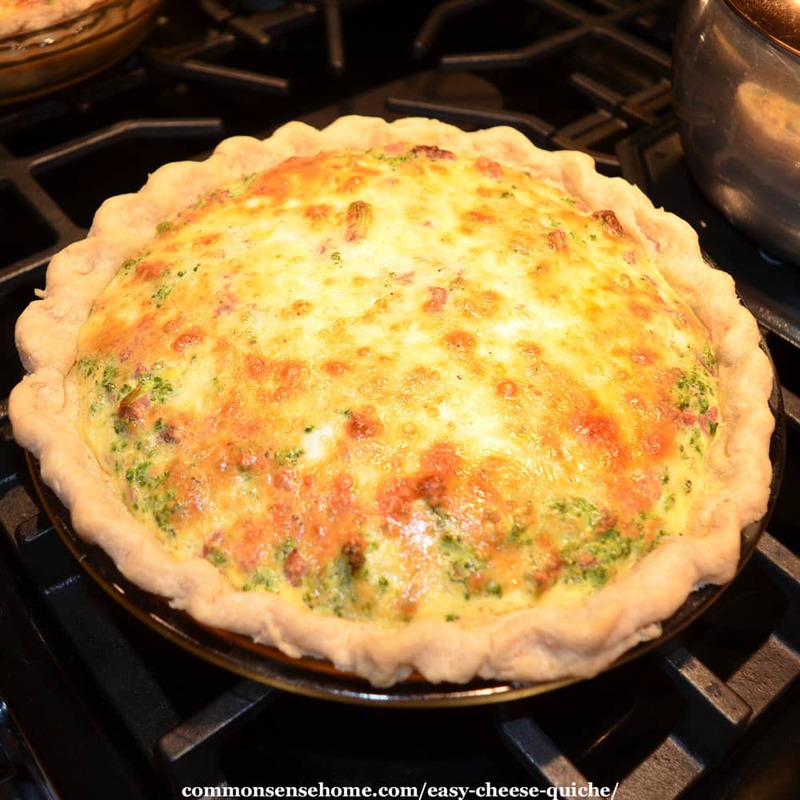 Flavorful cheeses like Swiss, Gruyere, Jarsberg, sharp chedder and feta work well in quiche, but feel free to experiment with what you have available. You can even use goat cheese or funky farmer cheese. (Really soft cheese like cream cheese or cottage cheese is not a a good fit for this recipe, but I'm sure someone uses it.) We made the quiche in the photos with a combination of Swiss and mozzarella. Which vegetables work well in a quiche recipe? Andrea recommends artichokes, asparagus, broccoli, broccoli rabe, cauliflower, chard, corn kernels, fennel, leeks, snap beans and spinach. You want a vegetable quiche that is firm, not sloppy, so avoid high water fresh veggies like tomatoes. I usually throw fresh vegetables right in, but if you like your vegetables more well-cooked, blanch them before assembling the quiche. If you're using frozen vegetables, thaw them completely and drain off excess liquid before adding them to the quiche recipe. It's best if they reach room temp. If they're chilly when you add them to the quiche, you'll need to add a little more baking time. 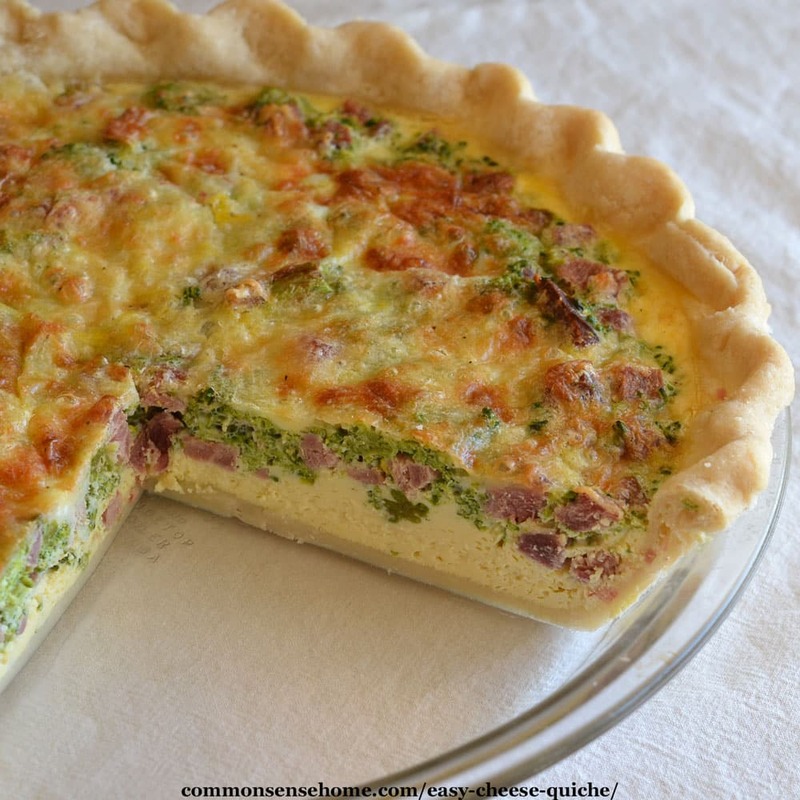 Freeze dried vegetables (and meat) work really well in this quiche recipe. Since they don't release liquid during cooking, you can add more vegetables without making the quiche watery. (I double the amount of vegetables when I use freeze dried.) 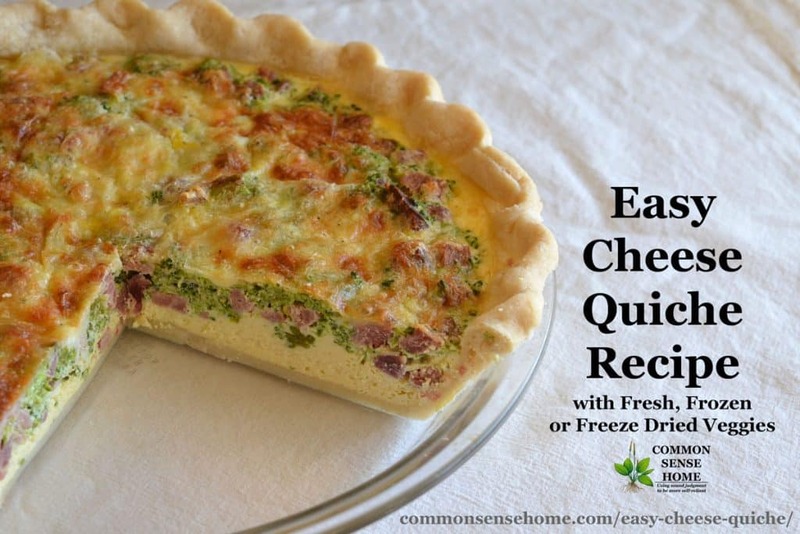 The quiche featured in the photos was made with home freeze dried broccoli and freeze dried ham. To make sure my freeze dried broccoli and ham were completely rehydrated, I soaked them in the egg and milk mixture for about half an hour before assembling the quiche for baking. Instead of mixing up the quiche filling last, I mixed it up first and added the freeze dried items. Then I mixed up the crust, par-baked it, and assembled the quiche recipe. 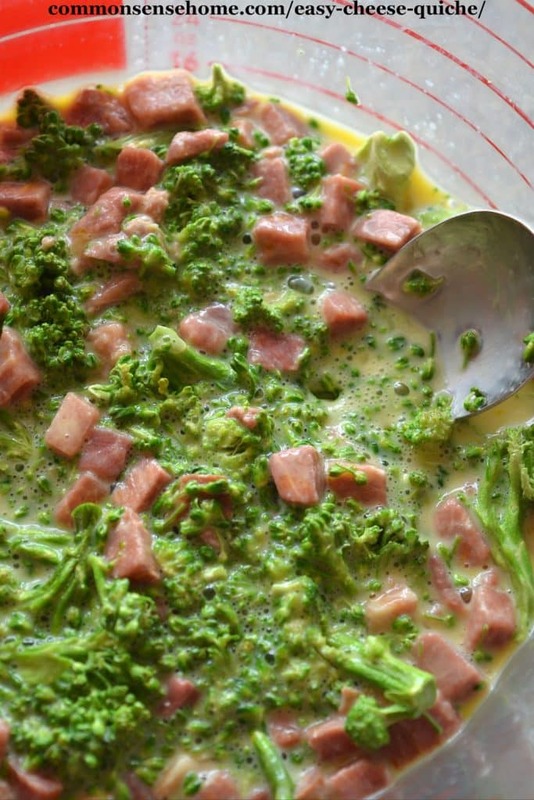 The freeze dried ham and broccoli rehydrating in the eggs and milk for the quiche. Can I use a premade crust for my quiche recipe? Yes, this recipe will work fine with a premade crust, by if my teenage son can make a homemade pie crust, I bet you can, too. The “secret” is to keep all your ingredients cold, and don't overwork the dough. Bake the crust for 5 minutes, until lightly colored. Remove from the oven and let cool. Reduce the oven temperature to 375°F. Sprinkle 1/2 cup of the cheese in the crust. Make a layer of the broccoli on top of the cheese. Sprinkle with the chives and meat (if desired). Beat the eggs in a glass measuring cup. Add enough milk or cream to make 1 1/2 cups. Season with salt and pepper. Pour over the vegetables. Sprinkle the remaining 1/2 cup cheese over the quiche. Bake for 30 to 35 minutes, until puffed and browned. Let stand for at least 10 minutes. Serve warm or at room temperature. 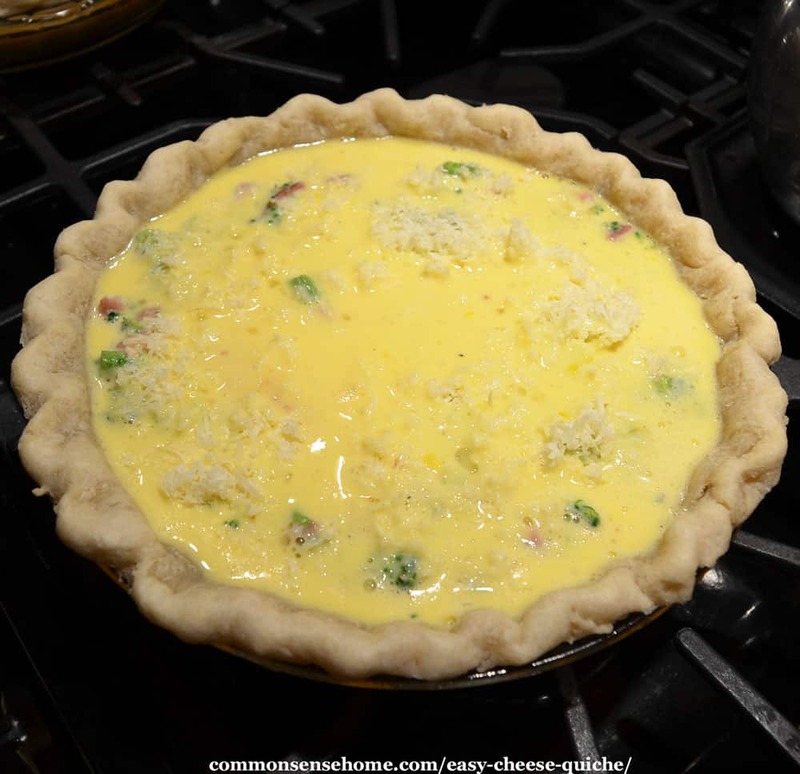 The quiche will puff up slightly while baking and then settle after it cools. Makes one 9 or 10 inch pie crust. Cut together flour, salt and butter with a pastry blender or two knives until the mixture resembles course crumbs. Sprinkle water over mixture, and blend with a fork until it just comes together. (Over-mixing will make the dough tougher.) To make your pie crust easier to roll, wrap in wax paper and refrigerate 30 minutes. Roll your pie crust into a 12 inch round between two sheets of waxed paper or reusable parchment paper lightly dusted with flour. Place in pan and crimp edges. What's your favorite easy one dish meal? How do you like to use garden produce for quick meals? Please leave a comment and let me know. I'm always looking for new recipes. This easy cheese quiche recipe works with a variety of vegetables and cheeses. You can also added diced meat for a more hearty meal. Bake for 30 to 35 minutes, until puffed and browned. Let stand for at least 10 minutes. Serve warm or at room temperature. 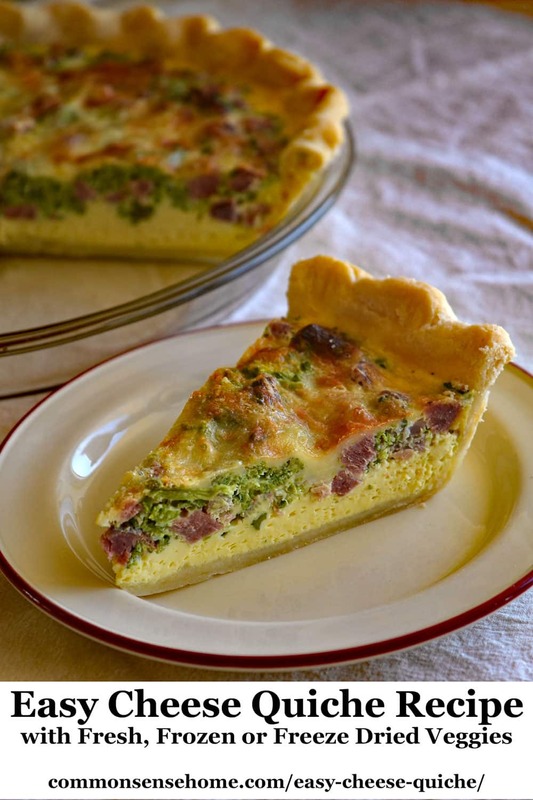 Flavorful cheeses like Swiss, Gruyere, Jarsberg, sharp chedder and feta work well in quiche, but feel free to experiment with what you have available. Originally published in 2011, updated in 2018. What a great idea! We're swimming in fresh eggs from our hens, so I think I'll have to whip up some quiche for my family this weekend. No veggies in our quiche, though; our garden is coming on late, late, late because of our super cool and rainy spring. The only thing we're harvesting at this point is lettuce, spinach, peas, a few early potatoes, and strawberries. Nice to see you, Jasmine. Your smile brightens my day. Thanks for sharing the recipe, with all our chickens laying great with all the sunlight I need egg recipes. Thanks for sharing your wonderful recipe at FAT TUESDAY. It looks delish! Hope to see you next week!